I left the Mid-Atlantic Nursery Trades Show (MANTS) in Baltimore last week with a deep case of plant lust. This is a serious problem on a number of levels, not the least of which is the fact that it’s beastly cold and snowy outside—hardly the season for planting. Normally, I come away from such shows with lists of annuals and perennials I’d like to try. The lust for these beauties is easily satisfied, since it’s a relatively simple matter to find garden space for them. This year, however, a couple species of native shrubs and trees grabbed my attention. Finding room for them is another matter altogether. 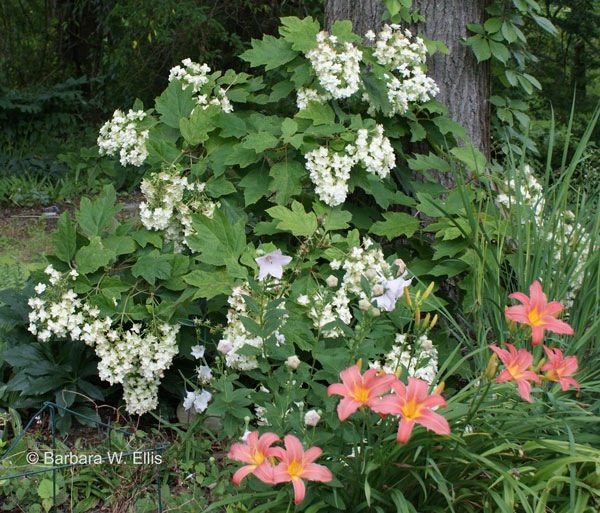 Above: Oakleaf hydrangea with daylily ‘Patricia Fay’. Oakleaf hydrangea (Hydrangea quercifolia) has been in every garden I’ve ever had, and the MANTS show renewed my my interest in this handsome native shrub. For those of you who don’t know it, it is a deciduous, summer-blooming shrub that also features fabulous fall color and attractive exfoliating bark. Plants range from 6 to 8 or more feet tall. They spread by suckers, and Michael Dirr (Manual of Woody Landscape Plants) estimates the spread at 10 to 12 or more feet wide. I should note here that while oakleaf hydrangea is a U.S. native, it isn’t from the Chesapeake Bay region. 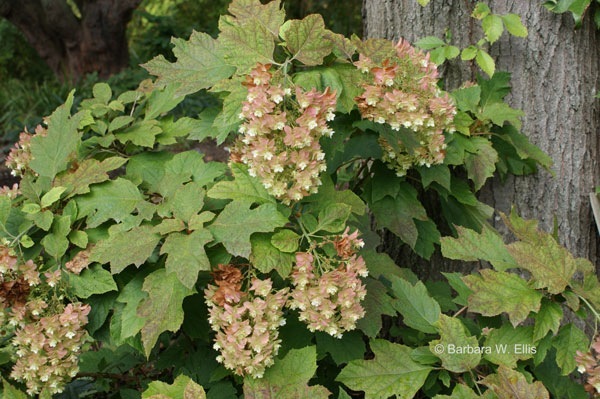 Oakleaf hydrangeas are native from North Carolina and Tennessee south to Florida and Louisiana. Still, it’s a wonderful garden plant—almost native—that I wouldn’t want to be without. Plants bear showy panicles of flowers from late spring through much of the summer. The blooms emerge white and turn pink with age. As the common name suggests, the lobed leaves resemble oak foliage. Deep green in summer, they turn shades of scarlet, orange, and purple in fall. Stems with red-brown exfoliating bark are revealed once the leaves fall. Above: Foliage color in early fall. ‘Munchkin’ and ‘Ruby Slippers’, the cultivars that piqued my interest at the MANTS show, are both are introductions from the National Arboretum’s excellent breeding program. I don’t see them listed on any retail sites yet, but they’ll get there eventually and will be well worth the wait if other Arboretum introductions are any indication. (The Arboretum, which doesn’t sell them directly, is currently promoting them to wholesalers who will build stock for sale to the public.) Both ‘Munchkin’ and ‘Ruby Slippers’ are dwarf cultivars selected for size as well as attractive flowers that fade to shades of pink. For more information on them, see http://www.usna.usda.gov/hydrangea.html. Both should be available soon, and I can tell you both will be in my garden as soon as I get my hands on them. In the meantime, there are other great cultivars out there. My vote is to collect them all if you have the space. Here are a few favorites. ‘Snowflake’. This is the one cultivar currently in my garden. It ranges from 6 to 8 feet tall and bears double flowers—technically the individual florets in the panicle have more than one petal-like bract. Flower panicles are longer and showier than the species. They range from 12 to 15 inches long and open over a longer season, too. The panicles are heavy and tend to weigh down the branches, but in my opinion they are still quite graceful. My plant isn’t in the most ideal site, and site selection has hampered its performance. The soil dries out more than it should, so wilting is a problem in dry weather, plus the plant is exposed to wind. As long as I water it periodically during dry weather and keep it well mulched, remains attractive, but with better growing conditions it would bloom more heavily and would hold its leaves better in fall. Above: ‘Snowflake’ in late summer, as the flowers fade from white to pink, then brown. ‘Pee Wee’. This is an outstanding dwarf form I’m planning to plant this spring. It ranges from about 3½ to 4½ feet tall and spreading to 6 feet or so. The 4- to 5-inch-long flower panicles are smaller than the species, as are the leaves. judged.” It features compact 6- to 8-inch-long panicles of flowers on sturdy stems that do not flop over. 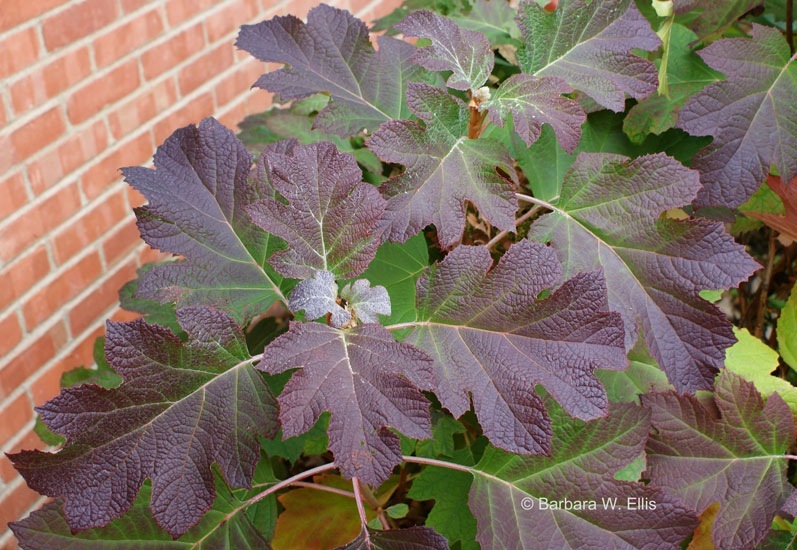 Like all oakleaf hydrangeas, it features outstanding red to red-bronze fall color. Not sure where I’ll put one yet, but it’s on my list! ‘Little Honey’. Selected for its gold to chartreuse foliage, this is a sport of ‘Pee Wee’. Plants range from 3 to 4 feet tall and wide and bear 6- to 8-inch panicles of white flowers. I’ve trialed ‘Little Honey’, unsuccessfully, but I don’t think the sample plant got fair treatment. I planted it in a spot that received sun in the afternoon and shade in the morning where it languished in the heat. (In my defense: My garden was very new then, and I only had a few available sites that were ready to plant.) By the time I moved it to a somewhat better site, the plant decided it had struggled long enough and succumbed. That said, I will try it again in a shadier site with richer, moister soil. The foliage was stunning. So, you can see my dilemma. I’ve got quite a bit of space to find and planting to do if I’m going to find room for all of these. Oakleaf hydrangeas have a somewhat coarse texture that can make them hard to incorporate in traditional landscapes. I like the bold foliage texture they bring to the garden, and their summer flowers are hard to beat. Newer dwarf types are easier to incorporate in residential landscapes. Use them in shrub borders, as specimens, along woodland edges, and in the shade garden. Give oakleaf hydranges a spot in partial shade with rich, moist, well-drained soil. A spot with morning sun and afternoon shade is ideal. Mulch to keep the soil cool and moist. Water during dry weather. Plants bloom on old wood (growth from the previous year) so prune, if necessary, in August immediately after flowering. HI Barbara – Just stopping on by to let you know a video of you is now posted at washingtongardener.blogspot.com. Thanks for stopping by! I’m planning to trial the Stromanthe this summer–just haven’t figured out where I’ll get it yet! Wonderful profile on these gorgeous and wonderfully architectural hydrangeas. We are planning a trip this Febuary to see the dwarf hydrangeas at the witch hazel festival there….Thanks for posting these…Beautiful..Nice to see blogs on Eastern Shore gardening. Hi! Glad to get you thinking about hydrangeas! I’ve started listing plants for my order! Can’t wait for all this snow to melt and the soil to get warmed up enough for hellebores and winter aconites! Can I turn the flowers blue by making the soil more acid? Hi! Oakleaf hydrangeas (Hydrangea quercifolia) always have white flowers, and changing pH doesn’t affect the color. The blooms do fade to pink as they age. The hydrangeas that change flower color are bigleaf hydrangeas (H. macrophylla). This works with both the mophead types (the ones with the round flower clusters) and the lacecaps, which have flat flower clusters.